There’s that classic moment in Monty Python’s Life of Brian when the People’s Front of Judea, during their meeting to discuss the overthrow of the accursed Romans, end up getting into a heated discussion: “What have the Romans done for us?” And the answer is, of course, quite a lot (aqueducts, sanitation, roads, and so on). But as the list increases, so their leader, Reg, gets increasingly wound up by the distraction from his overriding grudge. I was feeling a bit like Reg yesterday, watching the hordes losing sanity and decency all for the sake of a 30-per-cent-off bargain. America probably has given us a lot of good things that improve our lives, but Black Friday certainly isn’t one of them. I’m really not feeling a lot of love right now toward those who gave us this four-year-old import from across the pond. Sure, we all like to save money, but seeing people fighting and getting abusive over a TV in a supermarket is almost sickening in its depravity. Black Friday now marks the official start of the commercialised version of Christmas. I’m trying really hard not to let it ruin my love of this time of year, but I feel like I’m in the midst of a battle that has already been lost. We’ve made our way through the preliminary overture of Halloween, which has surely become the most pointless secular festival of the year. It allows us to get our spending going on various cheap pieces of plastic junk before the main event starts to unfold. We’ve just about made it through the joys of Black Friday in one piece, and can now look forward to Cyber Monday for a second helping. Don’t forget to stick even more lights on the outside of your house next week. Remember tastefulness and understatement at Christmas went out of fashion a long time ago. Make sure, too, that you only use the plump, jolly, red version of Santa that Coca Cola bequeathed to us back in 1931. And buy too much food and spend too much on your credit cards, trying not to let it worry you until the bill drops through the letterbox in January. Don’t even feel guilty if Jesus doesn’t get a look in. Materialism and greed are firmly established as the new gods of Christmas. According to recent polls, 51 per cent of people now say that the birth of Jesus is irrelevant to their Christmas. Just 12 per cent of adults know the Nativity story in any depth, and 36 per cent of children do not know whose birthday is being celebrated during the festival. Fantastic. We’re well on the way to taking God out of Christmas and in His place we’ve blessed ourselves with a season of meaningless over-consumption. As is the nature of such practices, once the piles of shredded wrapping paper have been disposed of, we’ll be left wondering whether it was worth all the fuss, and certainly feeling no better for it. Is anyone else more than a little disappointed with where we’ve ended up? A hundred years ago, Advent, which starts tomorrow, was a period of fasting that pointed towards Christmas Day. 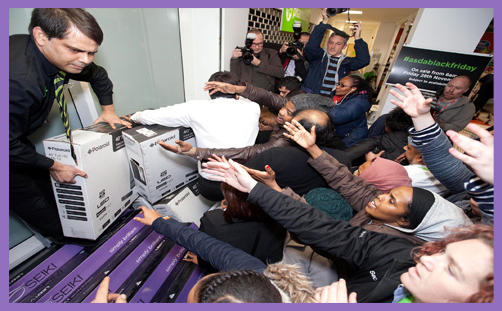 Now Black Friday jumps the gun and takes our eyes off the meaning of it all even more. After the spending frenzy, parties and preparations, it’s very easy to end up being so exhausted that we’re glad to get Christmas Day over with. There is a distinct irony that the key players in the story that gave us Christ-mass didn’t have a slick, big budget marketing campaign with celebrity endorsements. Instead, Mary and Joseph turned up late to Bethlehem dirty and tired. The setting for the night above all nights was a grimy space only fit for animals, and the supporting cast was a collection of nobodies who were more used to sheep for company. When the greatest gift of all arrived, He was not wrapped in any finery, but at that moment the sky burst open in angelic celebration that no TV performance could ever match. Christmas becomes far more valuable when we accept that the gifts we give each other are nothing compared to God’s heavenly gift embodied in a baby. The greatest joy at Christmas cannot be bought with any amount of money. What looks worthless on the outside brings eternal satisfaction, but if we choose to place shiny, glittery things at the centre of Christmas, then no matter how much effort we put in or how much we spend, we will never come away fully satisfied or with any sense of perspective of what really matters. I realise that this might well sound like the ranting of someone who is turning into a grumpy old man. I may be annoyed with the news reports of shoppers coming close to rioting. But, above any sense of anger, are feelings of pity and sadness that so many are searching for their very own perfect Christmas, full of joy and happiness, but will not find it even though it is laid out for the taking because they celebrate Christmas with their eyes closed. There is a beautiful light that shines brightly at this time of year, and it is waiting to be seen. This light is the true hope of Christmas that leads to a full and abundant life. But until eyes and hearts are opened, and Jesus is placed back at the centre, we can only expect these increasingly hedonistic retail frenzies to be the feature that defines this once holy season.